A 26-year-old woman, Mrs Bunmi Adebayo, says desperation to have a baby after 10 years of a childless marriage made her to steal a three-week-old baby in Modakeke, Osun State. She allegedly stole the baby, Oluwaseun David, on Sunday, July 1, 2018. The state Commissioner of Police, Ahmed Iliyasu, on Tuesday said the suspect took her desperation too far. The suspect, who resided in Magboro, in the Obafemi/Owode Local Government Area of Ogun State, was arrested on Saturday at Orile Imo village by the men of the state police command, where she had fled with David. The CP said the woman had lied to her husband, who used to visit her at her abode at intervals, that she was pregnant. Iliyasu added that after nine months, the suspect called her husband and broke the news that she had been delivered of a baby boy. He said the elated husband, Gbenga Adebayo, rushed down to her residence, but became curious when he demanded the placenta and the suspect was unable to present it. Having realised that the husband was suspicious, Bunmi was said to have absconded from home, prompting Gbenga to report the matter to the police. 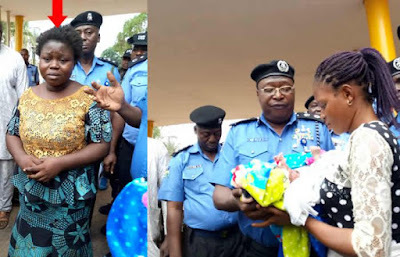 The police search team reportedly caught up with her and the stolen baby at Orile Imo on Saturday, and she was arrested, while the baby was rescued. Bunmi, who claimed to be a hairdresser, said, “I am 26 years old and I have been married to my husband for 10 years, but I have yet to have any child. Iliyasu later handed over the baby to his parents, Eniola and Peter Oluwaseun. They both expressed joy at getting back David, who they said was their first child.